Tomorrow Anna Allgeyer turns 92 years old. She is the mother of 5 children including me, the grandmother of 5, the great-grandmother of 9. Her short term memory and attention span are both disappearing now at a rate that is alarming to her (‘I hate myself!, she says when she realizes the frustrations the onset of senility bring not just to herself but her family. She hates forgetting, not herself. ) I am visiting her through Thanksgiving in NH. The semi-rural location is a cell phone dead zone for my carrier and of course my ma is not connected to the internet. In some ways, the situation at my mother’s house is more isolating than my time in India was. Anna doesn’t always remember why I was in India but she does have reminders of Scott scattered throughout her house amongst pictures of her other kids. The painting shown here is one that Scott did for Anna back in 2007. 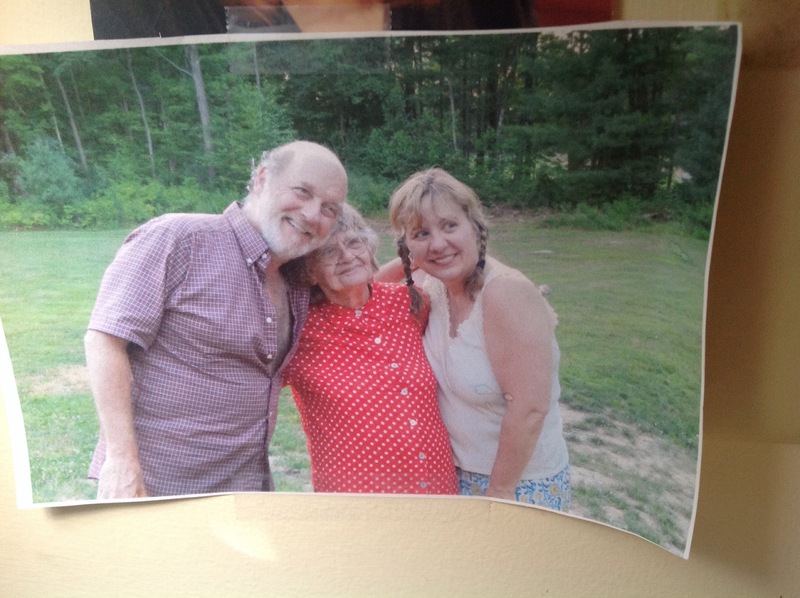 We always stopped by her house on our way back n forth from Maine to North Carolina. Invariably my mother would say ‘Meet me at the Cat & Fiddle!’ for lunch. And so we would. 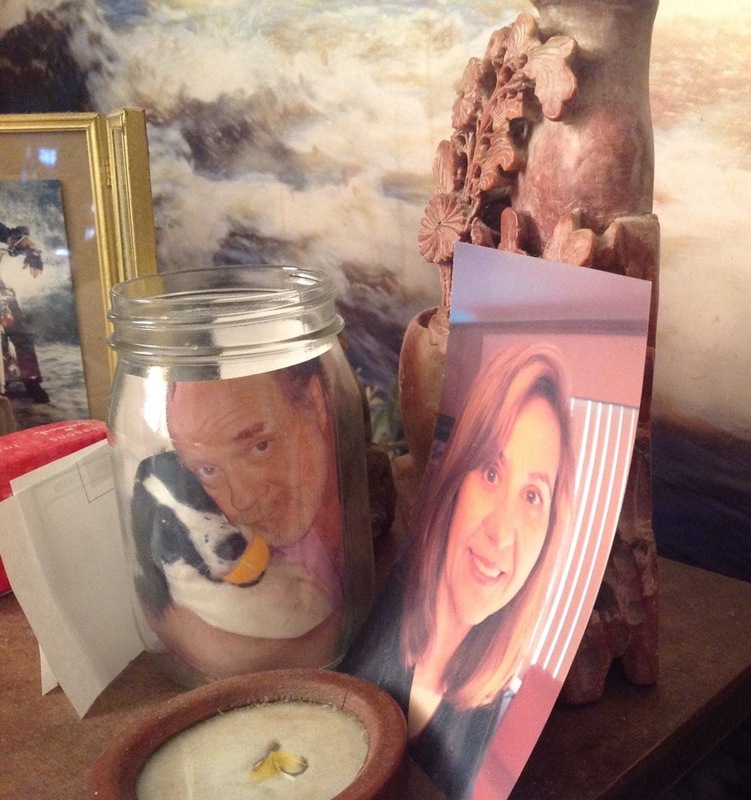 Don’t ask me why Scott & Loolie’s photo was placed in a Mason jar instead of a photo frame. It makes sense to Anna. The photo of the three of us made me smile. The occasion was an early celebration of mother’s 90th birthday in July 2011. We took advantage of all but one of her grandchildren and all the great grandchildren being in NH that week and decided to surprise her with a cake and party. Scott and I drove the 6 hours down from Stonington for this rare event. What strikes me most is how robust Scott looks, how happy my mother was to lean into his strong shoulder. As was I. 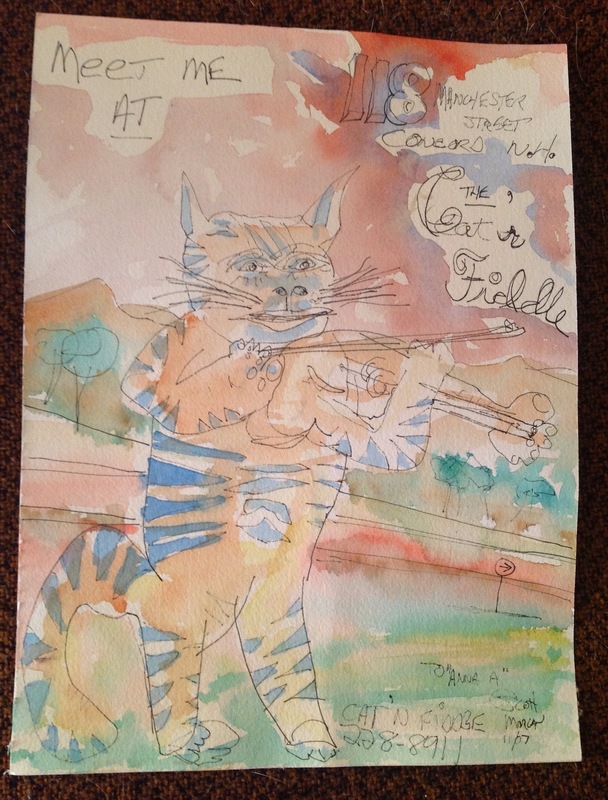 This entry was posted in Uncategorized and tagged anna allgeyer, art, artist, cancer, coping with grief, family, Going to Goa Blog, Katy Allgeyer, painting, paintings of cat & fiddle, Scott Morgan, senility, watercolor, why we went to india. Bookmark the permalink. Another beautiful and touching lil story that warms the heart. Happy Birthday Mrs. A., you have a most amazing daughter in Katy. vicki my mom had a great day, thanks.